Ambassador Danon meets with EU ambassadors to discuss rise in anti-Semitism in Europe and around the world. Israel's Ambassador to the United Nations Danny Danon held a discussion with ambassadors from the European Union on Tuesday on the rise of anti-Semitic incidents around the world, including the alarming rise in Europe. 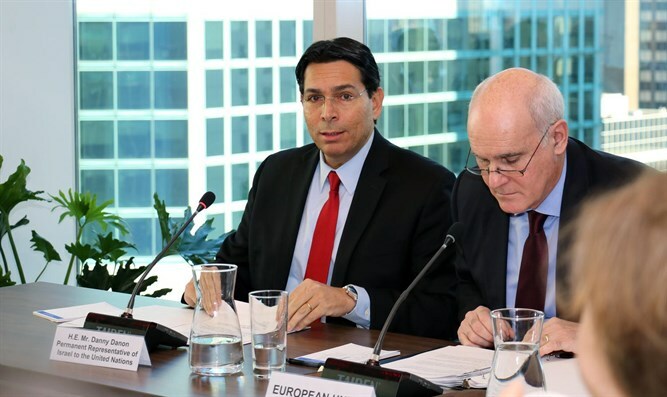 In a special meeting held Tuesday at the headquarters of the European Union delegation to the UN, Ambassador Danon called on his European counterparts to join forces in the fight against the growing manifestations of hatred in recent years. "A radical and hate-filled minority wants to lead Europe into a gloomy and worrisome period, and our moral duty at this time is to combine forces and act together against modern anti-Semitism," Ambassador Danon said. "Israel stresses to the governments the need to adopt the IHRA definition of anti-Semitism, which is a moral and ethical compass, and to increase anti-hate education from an early age and to monitor anti-Semitic messages on social networks," he said. "The struggle against anti-Semitism is a struggle for the future of Europe," Ambassador Danon summed up his words to his counterparts from European countries.